Happy Monday, world! In my neck of the woods, it’s full-on summer storming outside, but I hope things are brighter and sunnier where you all are! In recognition of the “Monday Blues,” I’ve got some funky nails to show you today. 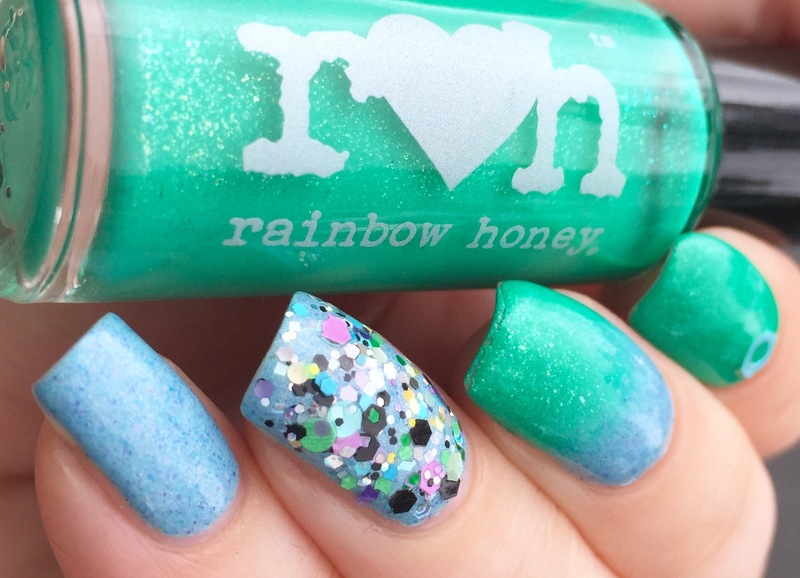 On my pointer finger, I’ve got Rainbow Honey “Calama,” a bright green with gold flakies. This came in the monthly mystery bag from Rainbow Honey (which I get because I really like their lip balms and bath/body products). I think it was also be available on their website later. 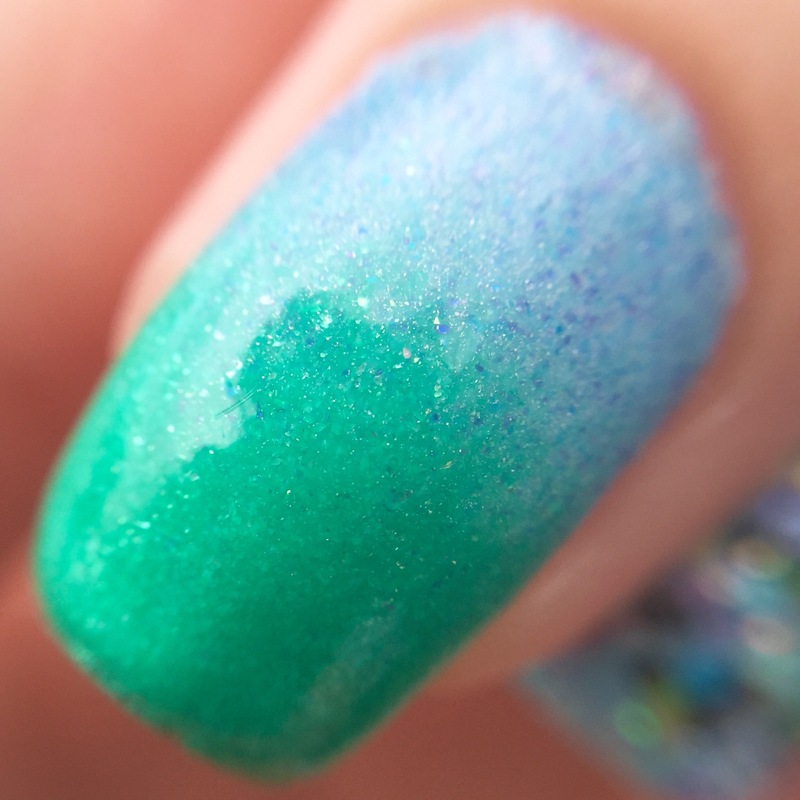 On my middle finger, I have a gradient of “Calama” and Love, Angeline “Let’s Eat Cake.” This has a formula similar to “Surprise!” (reviewed here)- two easy, smooth coats packed with blue and purple flakies, with a kick of scattered holo thrown in. (Unfortunately you can’t see the holo due to the cruddy weather here.) on the plus side, this is still in stock on the Love, Angeline website, in case blues are your kryptonite. I am always wearing “Let’s Eat Cake” on my ring and pinkie fingers. To zazz things up, I sponged on some glitter (a Lone, Angeline prototype from a mystery bag) on my ring finger over “Let’s Eat Cake.” To be honest, this glitter was the impetus for the whole mani- I’ve been dying to wear it, but couldn’t figure out what color would be best under it. Hence the mix of blue and green to echo the glitter colors. To tie in the glitter accent with the rest of the mani, I added a big, blue hex glitter (from a pack of glitter babies from Vibrant Vinyls) to my pointer finger. Overall, I was going for something fun and funky. It’s a lot of different elements for me all in one mani, but I like how it turned out! What do you think? Do you ever just go “zazzy” for the heck out it? Do you have a glitter that you struggle to match that’s just sitting around, waiting for your love? Love how all of the different elements come together in an awesome look! That Love Angeline polish is gorgeous! Thanks! I’m loving how all the polishes from that birthday party collection look. Nice job on the gradient! I have tons of Lynnderellas just sitting around waiting to be worn. I like to find unexpected undies for them. This is a really cute mani. I love all the colours together, they go very nicely! This is gorgeous! We have been lucky to not have any rain for a while. There for 3 weeks it did nothing but rain, it was miserable! Beautiful mani! The glitter topper makes the perfect accent to tie the whole look together. I swear all I ever see is mermaid. 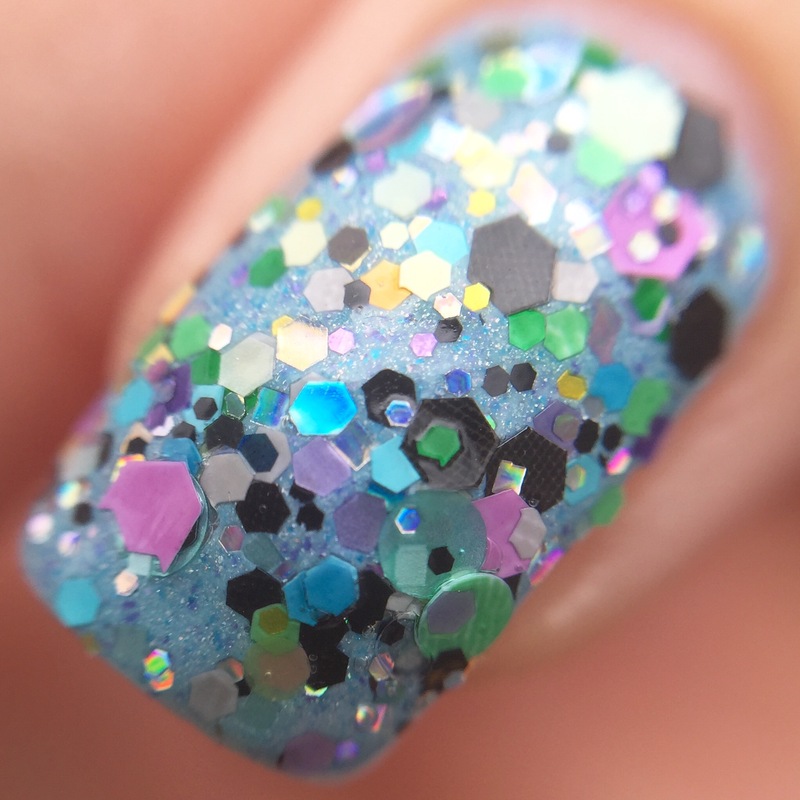 Seriously these look like the perfect mani for a underwater princess haha. 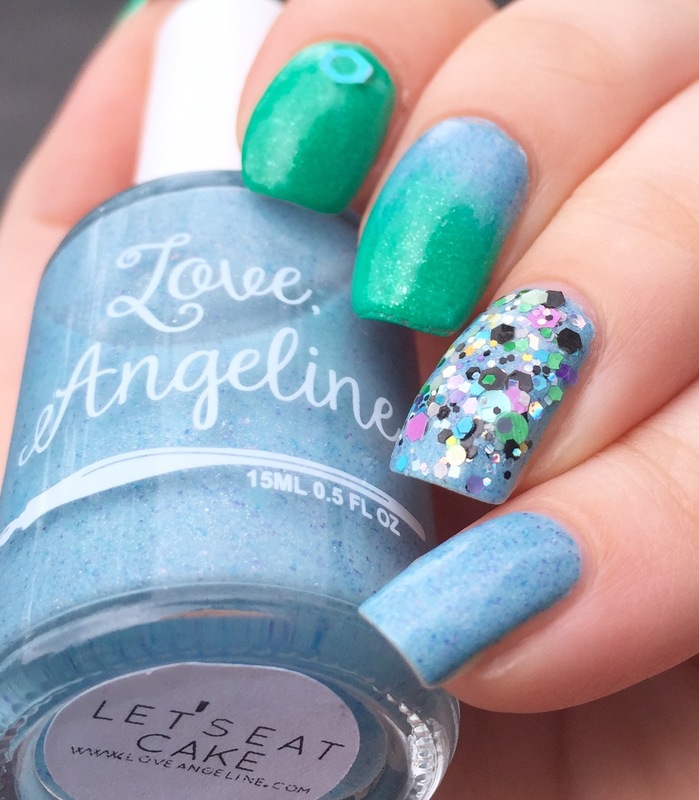 Those blue flakies in the Love, Angeline are stunning! I’m drooling over all those glitters packed onto your ring finger. Very cute! The color combo is fabulous!